Born in Blackheath in 1924, John Hughes was educated at Christ’s College, Blackheath, Dulwich College, and after war service in the Navy (including a period in Hiroshima very shortly after the dropping of the atomic bomb) , he studied at St John’s College, Durham from 1945 to 1951 (BA 1948, DipTh. 1950 and MA 1951). After a curacy at Westcliff-on-Sea, Essex, and two years as Succentor of Chelmsford Cathedral, he came to Leicestershire, first as Vicar of St Barnabas, Leicester, from 1955-61, and then as Vicar of Croxton Kerrial from 1961-63. Following the sudden death of Provost Moyson on 1963, Bishop Ronald Williams invited John Hughes to be Provost of Leicester Cathedral, a position he held with great distinction until 1978. During his period in office among many other things he led a major programme of restoration work on the Cathedral buildings and the associated fund-raising that this required, and he also established a Girl’s Choir, the first in any English Cathedral. He was very active on other aspects of the city and country’s life, serving among other things as President of the Rotary Club of Leicester for 1973-74 as well as the Literary and Philosophical Society. A member of the Leicestershire Archaeological and Historical Society for more than 50 years, his research and publications included histories of the Cathedral and of Launde Abbey, the diocesan retreat house, and a detailed account of the Cathedral’s stained glass. 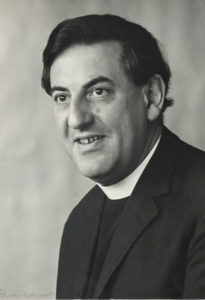 In 1978 he required major surgery to try to correct a serious back problem, which was to continue to plague him for the rest of his life, so he decided to resign from the Cathedral appointment, and moved back into the lighter duties of parish life as Vicar of Great Easton with Drayton, a position he held until 1987. On his retirement he moved to Hallaton, helping to cover that parish during two long interregnums, as well as remaining a popular guest preacher until his general health deteriorated towards the end of his long life.